Motherwort (Leonurus cardiaca) - Open your heart to the Life Force Matrix of the Universe to receive Divine Love and Compassion. Experience that at the same time, in no time, your heart energy extends far into the Universe, and is also here now in this moment. Deep Peace. I AM Divine love, compassion and deep peace received through heart connection to the Life Force Matrix of the Universe. 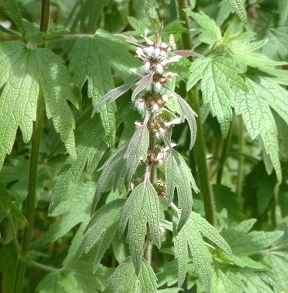 Motherwort herb is native to Asia and has naturalized across much of Europe and North America. It is often used for heart and nervous system issues such as hyperthyroid, palpitations and panic attacks. Motherwort helps to relieve menopausal symptoms like hot flashes, nervous anxiety, sleep disturbances, and depression. An unresolved shock to the emotional heart - possibly from trauma, neglect or loss of a loved one - may lead to feeling detached and joyless. You may feel separated from Spirit, be self critical, seek approval, or feel less than others. There may be hardness in your communication and actions to cover up insecurity. Other symptoms might include depression, high or low blood pressure, hyper or hypothyroid, physical heart problems, nervous anxiety and emotional exhaustion. These symptoms may appear or become accentuated during menopause. Motherwort flower essence works through the front of the heart chakra to help you feel/sense that your heart is connected to the matrix of ALL, the spiritual Life Force of the Universe. It invites you to experience that at the same time, in no time, your heart energy extends far into the Universe, and is only here now in this moment. This engenders deep peace and quiet. Motherwort essence promotes the heart chakra to spin with an open and stable flow, and clears the area where the heart chakra moves through your personal physical, emotional and mental energy fields. It encourages love and compassion for yourself, and soothes the sense of emotional boundary violation by another person. Motherwort Flower Essence was made by the no-pick method of working directly with the plant spirit. While the essence was being made a matrix of Amber, Azeztulite, Cherry Quartz, Danburite, Drusy Quartz, Icosahedron Cut Quartz, Morganite, Nirvana Quartz, Peruvian Pink Opal, Pink Lemurian Seed Crystal, Rhodochrosite, and Rose Quartz crystals were placed among the plants with the mother bottles. The sun acts as a transformer to step down spiritual energies from higher dimensions. While the essence was being made, Amber acted as a lens to receive and focus sunlight for this purpose. Azeztulite facilitates connecting and resonating with the Nameless Light. From this connection you will gain a greater wisdom and understanding of who you truly are – a being of Light. Encourages you to bring this Light into the world. As an antidepressant, Cherry quartz instills hope and helps you to see the bigger picture. Strengthens the heart. Danburite increases communication with angels and other high frequency beings. It facilitates embodying resonance with the Divine Heart, so you may be of service by bringing this energy to the world. Drusy quartz crystals help to energize and stabilize your subtle bodies. Icosahedron cut quartz has 20 (5X4) equilateral sides. It is a bridge between the 5th Dimension - the entry into the unified Spiritual realms - and the 4 cardinal directions (N, S, E, W) on Earth. Morganite opens your heart to the level of Cosmic Love that is all around us. It strengthens the heart’s energy field and teaches protection through love instead of fear. Nirvana quartz teaches you that situations you experienced as stopping your growth were actually key in tempering your spirit. They helped your unique wisdom to be honed through life’s journeys. Peruvian pink opal clears and calms the heart and brings a sense of peace and tranquility. Pink Lemurian Seed Crystal instills a gentle, loving and strong connection with the Divine Feminine through the heart chakra. Rhodochrosite instills a courageous heart; it gently aids with healing past wounds, rediscovering self-love and embracing joy. Rose Quartz encourages gentleness, emotional healing, and uniting with the Divine; it shifts your body from a stress-based physiology to a higher frequency Love-based physiology. The actions of the crystals inform the way this flower essence seats into the physical body. While this essence was being made spirit song coming through Diana’s voice, was imprinted into the essence. Hummingbird also graced this essence with its imprint of playful joy, presence and lightness of being.